Gorgonia is a library that helps facilitate machine learning in Go. Write and evaluate mathematical equations involving multidimensional arrays easily. If this sounds like Theano or TensorFlow, it's because the idea is quite similar. Specifically, the library is pretty low-level, like Theano, but has higher goals like Tensorflow. The main reason to use Gorgonia is developer comfort. If you're using a Go stack extensively, now you have access to the ability to create production-ready machine learning systems in an environment that you are already familiar and comfortable with. ML/AI at large is usually split into two stages: the experimental stage where one builds various models, test and retest; and the deployed state where a model after being tested and played with, is deployed. This necessitate different roles like data scientist and data engineer. Typically the two phases have different tools: Python/Lua (using Theano, Torch, etc) is commonly used for the experimental stage, and then the model is rewritten in some more performant language like C++ (using dlib, mlpack etc). Of course, nowadays the gap is closing and people frequently share the tools between them. Tensorflow is one such tool that bridges the gap. Gorgonia aims to do the same, but for the Go environment. Gorgonia is currently fairly performant - its speeds are comparable to Theano's and Tensorflow's CPU implementations. GPU implementations are a bit finnicky to compare due to the heavy cgo tax, but rest assured that this is an area of active improvement. The package is go-gettable: go get -u gorgonia.org/gorgonia. Additionally, Gorgonia uses dep as its vendoring tool. The MINOR number will be incremented every time there is a deletrious break in API. This means any deletion, or any change in function signature or interface methods will lead to a change in MINOR number. Additive changes will NOT change the MINOR version number prior to version 1.0. This means that if new functionality were added that does not break the way you use Gorgonia, there will not be an increment in the MINOR version. There will be an increment in the PATCH version. 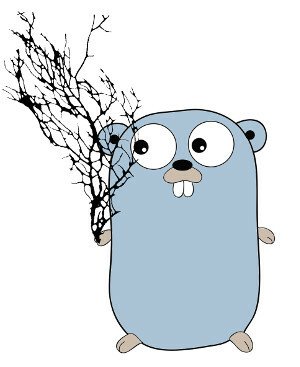 Gorgonia aims to support 5 versions below the Master branch of Go. This means Gorgonia will support the current released version of Go, and up to 4 previous versions - providing something doesn't break. Where possible a shim will be provided (for things like new sort APIs or math/bits which came out in Go 1.9). The current version of Go is 1.9.2. The earliest version Gorgonia supports is Go 1.6.x. Gorgonia's project has a mailing list, as well as a Twitter account. Official updates and announcements will be posted to those two sites. Gorgonia works by creating a computation graph, and then executing it. Think of it as a programming language, but is limited to mathematical functions, and has no branching capability (no if/then or loops). In fact this is the dominant paradigm that the user should be used to thinking about. The computation graph is an AST. Microsoft's CNTK, with its BrainScript, is perhaps the best at exemplifying the idea that building of a computation graph and running of the computation graphs are different things, and that the user should be in different modes of thoughts when going about them. Whilst Gorgonia's implementation doesn't enforce the separation of thought as far as CNTK's BrainScript does, the syntax does help a little bit. You might note that it's a little more verbose than other packages of similar nature. For example, instead of compiling to a callable function, Gorgonia specifically compiles into a *program which requires a *TapeMachine to run. It also requires manual a Let(...) call. The author would like to contend that this is a Good Thing - to shift one's thinking to a machine-based thinking. It helps a lot in figuring out where things might go wrong. Additionally, there are no support for branching - that is to say there are no conditionals (if/else) or loops. The aim is not to build a Turing-complete computer. They function differently and take different inputs. The TapeMachine is useful for executing expressions that are generally static (that is to say the computation graph does not change). Due to its static nature, the TapeMachine is good for running expressions that are compiled-once-run-many-times (such as linear regression, SVM and the like). The LispMachine on the other hand was designed to take a graph as an input, and executes directly on the nodes of the graph. If the graph change, simply create a new lightweight LispMachine to execute it on. The LispMachine is suitable for tasks such as creating recurrent neural networks without a fixed size. Prior to release of Gorgonia, there was a third VM - a stack based VM that is similar to TapeMachine but deals with artificial gradients better. It may see light of day again, once this author has managed to fix all the kinks. Gorgonia performs both symbolic and automatic differentiation. There are subtle differences between the two processes. The author has found that it's best to think of it this way - Automatic differentiation is differentiation that happens at runtime, concurrently with the execution of the graph, while symbolic differentiation is differentiation that happens during the compilation phase. Runtime of course, refers to the execution of the expression graph, not the program's actual runtime. Currently Gorgonia only performs backwards mode automatic differentiation (aka backpropagation), although one may observe the vestiges of an older version which supported forwards mode differentiation in the existence of *dualValue. It may return in the future. To read the graph is easy. The expression builds from bottom up, while the derivations build from top down. This way the derivative of each node is roughly on the same level. Red-outlined nodes indicate that it's a root node. Green outlined nodes indicate that they're a leaf node. Nodes with a yellow background indicate that it's an input node. The dotted arrows indicate which node is the gradient node for the pointed-to node. Concretely, it says that c42011e840 (dy/dx) is the gradient node of the input c42011e000 (which is x). If it's an input node, then the Op row will not show up. If there are no Values bound to the node, it will show up as NIL. However, when there are values and gradients, it will try to as best as possible display the values bound to the node. CUDA toolkit 9.0 is required. Installing this installs the nvcc compiler which is required to run your code with CUDA. The CUDA ops must be manually enabled in your code with the UseCudaFor option. runtime.LockOSThread() must be called in the main function where the VM is running. CUDA requires thread affinity, and therefore the OS thread must be locked. CUDA will not be used. And even so, only the tanh function uses CUDA. The main reasons for having such complicated requirements for using CUDA is quite simply performance related. As Dave Cheney famously wrote, cgo is not Go. To use CUDA, cgo is unfortunately required. And to use cgo, plenty of tradeoffs need to be made. Therefore the solution was to nestle the CUDA related code in a build tag, cuda. That way by default no cgo is used (well, kind-of - you could still use cblas or blase). The reason for requiring CUDA toolkit 8.0 is because there are many CUDA Compute Capabilities, and generating code for them all would yield a huge binary for no real good reason. Rather, users are encouraged to compile for their specific Compute Capabilities. Gorgonia's API is as of right now, not considered stable. It will be stable from version 1.0 forwards. As we move towards 1.0, the github repository will be moved to the organization gorgonia. See the issue for more updates. 80+% test coverage. Current coverage is 50% for Gorgonia and 80% for the tensor. More advanced operations (like einsum). The current Tensor operators are pretty primitive. Clean out the tests. The tests were the results of many years of accumulation. It'd be nice to refactor them out nicely. Use table driven tests where possible. Use testing/quick where possible. Improve performance especially re: allocation, minimize impact of type system. Improve Op extensibility by exposing/changing the Op interface to be all exported, and not a mix of exported and unexported methods (Alternatively, create a Compose Op type for extensibility). This way everyone can make their own custom Ops. Refactor the CuBLAS package as well as the Blase package to follow in vein of the CUDA implementation. Distributed computing. The ability to spread jobs out across multiple machines and communicating with each other has been attempted at least 3 times, but failed each time. Better documentation on why certain decisions were made, and the design of Gorgonia in general. The primary goal for Gorgonia is to be a highly performant machine learning/graph computation-based library that can scale across multiple machines. It should bring the appeal of Go (simple compilation and deployment process) to the ML world. It's a long way from there currently, however, the baby steps are already there. Obviously since you are most probably reading this on Github, Github will form the major part of the workflow for contributing to this package. All contributions are welcome. However, there is a new class of contributor, called Significant Contributors. Answered at least 10 support questions. Significant Contributors list will be updated once a month (if anyone even uses Gorgonia that is). The best way of support right now is to open a ticket on Github. Why are there seemingly random runtime.GC() calls in the tests? The answer to this is simple - the design of the package uses CUDA in a particular way: specifically, a CUDA device and context is tied to a VM, instead of at the package level. This means for every VM created, a different CUDA context is created per device per VM. This way all the operations will play nicely with other applications that may be using CUDA (this needs to be stress-tested, however). The CUDA contexts are only destroyed when the VM gets garbage collected (with the help of a finalizer function). In the tests, about 100 VMs get created, and garbage collection for the most part can be considered random. This leads to cases where the GPU runs out of memory as there are too many contexts being used. Therefore at the end of any tests that may use GPU, a runtime.GC() call is made to force garbage collection, freeing GPU memories. In production, one is unlikely to start that many VMs, therefore it's not really a problem. If there is, open a ticket on Github, and we'll look into adding a Finish() method for the VMs. Everyone is still allowed to use Gorgonia for commercial purposes (example: using it in a software for your business).